In 2009, The Railway Magazine broke the exclusive news from the HSBT Project that the storage and scrapping details of many BR steam locos were not as had been published widely in books and magazines. Following an appeal for help, our readers have responded magniﬁcently to requests for information and Roger Butcher now brings us up to date with the latest developments. LAUNCHED in 2009, the aim of the HSBT Project is to leave for future generations an authentic record of the fate of the 17,000 steam locomotives that existed in the last 12 years of the British Railways steam era. Named after the four men who established it (Terry Hayward, Richard Strange, myself and Peter Trushell), the project was launched when it was realised that the reference work on the subject – the What Happened to Steam (WHTS) series of booklets, published in the 1980s –contained serious inaccuracies. Since my exclusive articles in the November 2009 and October 2010 issues of The Railway Magazine a great deal of additional information, particularly regarding storage of withdrawn steam locos, has been received. Much of this information is completely new to the project and I am very grateful to all those RM readers who are helping to ﬁll in this huge jigsaw puzzle. We have discovered the existence of at least one (possibly three) further scrapping locations! Brunswick Junction, in Poplar, plus almost certainly Scunthorpe Normanby Park steelworks and Port Talbot, south Wales. In the ﬁrst part of this update, I will explain why so much storage information differs from the WHTS booklets and I will then answer –in Q&A form – as many as possible of the queries I have received since the previous article. How accurate is the information...? For each of the 17,000 locomotives under review, there are four key facts (storage location and date, disposal location and date), so that’s 68,000 separate facts. The Railway Observer (RO), journal of the Railway Correspondence & Travel Society (RCTS) was strong on scrapping locations but not on scrapping dates, whilst the amount of detail it published on storage locations and dates was relatively small. So, where did all the storage information contained in the WHTS books come from? In the ﬁrst RM article in 2009, Richard Strange of the Steam Railway Research Society (SRRS) – which has an extensive library of ofﬁcial BR records – stated that the books contained “a signiﬁcant amount of information that appeared simply to have been guessed at”. It was Richard’s belief that many of the storage locations in the WHTS booklets were simply the last allocated depot, whilst many of the dates merely ﬁlled in the gap between withdrawal and scrapping dates. 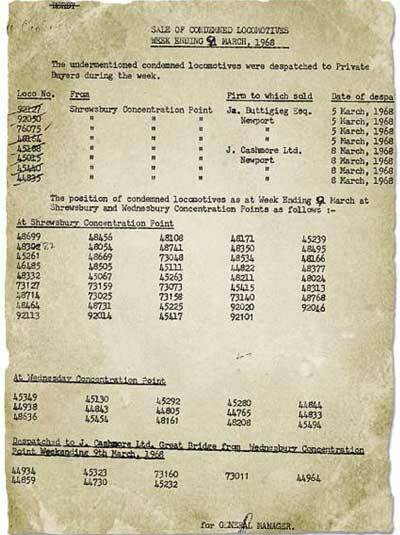 To view document in full screen, click on the image. Although Peter Hands, the compiler of the booklets, refutes that suggestion, I had made a similar point to Terry Hayward in 2008 when we had been discussing our personal observations of WR 2-8-0 No. 3862 stored at Didcot shed on March 28, 1965. That loco had been withdrawn on February 6, 1965 and its ﬁnal allocation was Croes Newydd, in North Wales – which is where the WHTS book showed it as stored from February to June 1965. However, before going public with our belief, we needed further evidence. Using the Western Region as an example, it is fair to say that the storage data we have since gathered bears little resemblance to that contained in the WHTS books. 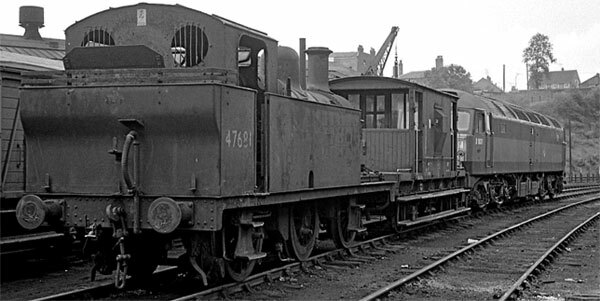 1: When a shed, because of restricted space available, did not normally store withdrawn engines. e.g. Bromsgrove, Goodwick, Merthyr and Yeovil. 2: When a locomotive failed away from its home depot and was stored at the shed at which it was condemned. There were many, many examples of this on the WR. 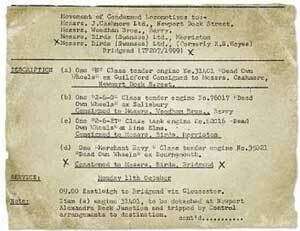 3: When there was a ‘paper’ transfer shortly before a loco’s withdrawal but the reallocation did not take place, e.g. 5744, 8728 and 9707. Above : The October 2010 issue of The Railway Magazine posed the question of where ‘Merchant Navy’ Paciﬁc No. 35021 New Zealand Line ended its days – either Bird’s of Bridgend, Bird’s of Morriston, or Eastleigh Works? No reports or observations of this loco in South Wales had been received until then, but, soon after publication, RM reader Bob Masterman sent paperwork showing its consignment on October 11, 1965, from Bournemouth, via Eastleigh and Gloucester, to the Bridgend yard of Bird’s (Swansea) Ltd (formerly R S Hayes). It was probably cut up soon after arrival at Bridgend, which would explain the lack of sightings in South Wales. 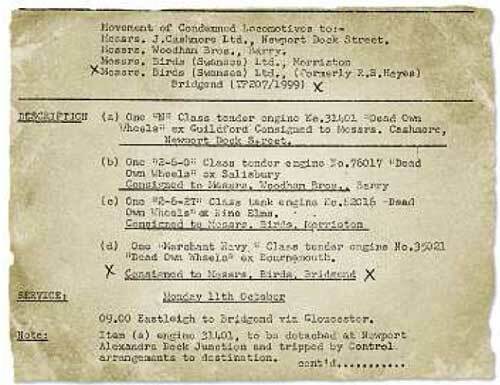 An extract from the movement notice is shown here. 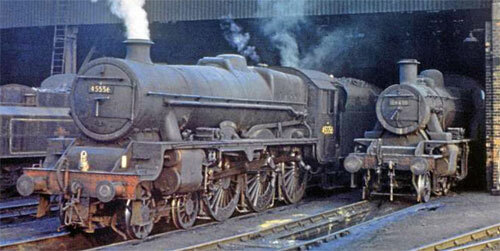 4: When locos were stored on sub-sheds which were rarely reported in the RO in the latter years of WR steam, e.g. Lydney, Whitland Pantyffynnon and Cheltenham Malvern Road. 5:When a home depot that usually stored its own withdrawn locomotives did not do so for a temporary period, e.g. Old Oak Common locos being stored at Southall when Old Oak was being rebuilt as a diesel depot. 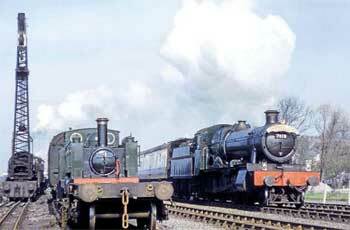 6: When a shed that had closed to steam stored locally-based withdrawn locos, e.g. Cardiff East Dock (when it was a diesel depot), Danygraig and Stratford-upon-Avon. Such storage details were virtually never recorded in the RO. 7: When a locomotive was sent straight to works on withdrawal (or was already there) but its presence at Swindon was not recorded in the RO. Often it would then be shown in the WHTS booklets as stored at its home depot. 8: Conversely, there were examples of condemned locos shown as stored at Swindon Works even though they were ‘sold from site’ and therefore never actually went there after withdrawal. 9: Failure to recognise the difference between a works and a shed when both were located in the same town. Many examples at Swindon show engines stored at works when it should have been shed, and vice-versa. 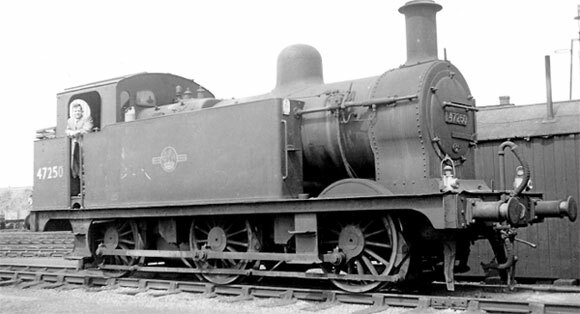 10: When confusion arose as a result of BR constantly changing shed codes in the 1950s and early ’60s. 11: The fact that so many scrap dates have been shown to be incorrect means, self-evidently, that the dates for storage have to be wrong as well because the scrap date quoted in the WHTS booklets is always one month after the end of the storage period given. In this category, a 2-3 month dating error is very common and 4-6 months not unusual. 12: Last but not least, there were many cases in which a ﬁnal transfer was not notiﬁed to the enthusiast/commercial press by BR at the time. This ﬁnal reason is probably the most interesting of all. The records of the SRRS, to which we at HSBT have full access, are based on ofﬁcial internal BR Regional advice sheets, whereas those published by society journals or commercial magazines in the 1950s and ’60s had varying interpretations of such information issued by the various Regional public relations ofﬁces. As the editor responsible for the Western Region edition of the books that HSBT intends to publish once our research is complete, I have been stunned by the number of reallocations that never made it into the railway press. It is rather sobering to think that the many books published since the end of BR steam purporting to deal comprehensively with locomotive allocations contain exactly the same omissions and errors – in other words they all originate from the same secondary sources. In those cases where a ﬁnal transfer was not notiﬁed in the railway press, the last allocated depot shown in the WHTS books does not reﬂect that ﬁnal change. So, for example, nine such locos from the Western Region are shown in the table above. Almost all the ‘actual storage locations’ for the withdrawn locomotives listed above were not only already on the SRRS database but were personally seen at those same locations by myself on shed visits in the 1960s. While the principles detailed above apply to the other BR Regions as well, space restrictions preclude speciﬁc detail. Special mention does, however, need to be made of the London While the principles detailed above apply to the other BR Regions as well, space restrictions preclude speciﬁc detail. Special mention does, however, need to be made of the London. The existence in 1968 of three major steam Locomotive Disposal Concentration Points (LDCPs) located away from operational depots on the LM Region –Shrewsbury Sutton Bridge, Wednesbury and Kingmoor (the former locoshed) passed largely unrecorded at the time,despite ofﬁcial documentation showing that no fewer than 290 steam locos went to LDCPs, some of them spending at least six months in such places! Consequently, the WHTS data often shows locos as having already been broken up in a scrapyard when in reality they were still stored at an LDCP, in some cases as far as 80 miles away! Although there is ofﬁcial documentation at Derby Industrial Museum for movements in and out of the LDCPs, there is no supporting rationale behind the reason for their existence. It has, however, been suggested that the locos’ non-ferrous parts were safer from the threat of theft than they would have been in sidings adjacent to the scrapyards waiting to receive them. Also, the sheer volume of locos being withdrawn from the surviving LMR sheds meant there was simply not enough space on the depots to store them. Did you get the reader response you hoped for from your previous articles in The Railway Magazine?Very much so! It resulted in a dialogue with all the major railway publishers who write or report on the storage and disposal of the steam locomotive ﬂeet. In turn, that led to an almost universal acceptance of our work and active co-operation with our aims. Can you give some examples of how publishers are co-operating?Some have ceased giving storage and disposal information and instead guide their readers to the HSBT Project. For example, in the book ‘British Railways Steam Locomotive Allocations’ (IanAllan/OPC), author Hugh Longworth states: “You will notice I have chosen not to give any scrapping details in this book. This area is currently the subject of a major research project being undertaken by the HSBT Project.” Details of the HSBT website are then given. Book Law: Author John Hooper has pledged his support and has kindly made available to the project some very useful information on Scottish-based steam locomotives. Irwell Press: The ﬁrst concrete example of co-operation is the second edition of ‘The Book of the Merchant Navy Paciﬁcs’, by Richard Derry, in which Keith Gunner (HSBT member with special responsibility for Southern locomotives) is suitably acknowledged, along with details of our website. Lightmoor Press: Both of ‘The Norman Lockett Archive’ books on Western Region steam contain generous acknowledgements of the work the HSBT team is undertaking. Railwayana sale catalogues: We have also been delighted by the response of the major railwayana auction houses (see example below). All the major railwayana auction houses now either use HSBT storage and disposal information in their catalogues or have simply stopped using the information they previously extracted from websites. Above is the relevant statement from the October 13, 2012 Great Central Railwayana auction catalogue. Is there a major publishing house that is still ‘holding out’? Yes, and I did not imagine for one moment that it would be the RCTS, the society I belonged to for nearly four decades, particularly when the majority of the HSBT team are members. Even though the compiler of the WHTS booklets, Peter Hands, has accepted that he was misled by false information from the “rogue correspondent” known as ‘Zulu’ on many of the entries, the RCTS seems reluctant to help us bring an end to the re-cycling of errors. In e-mails to me, he has attempted to explain his reasons by mentioning that the latter days of BR steam were characterised by re-sales, sub-contracts, poor paperwork and mysterious deals etc, rather than accepting that those books include information we know originated from ‘Zulu’. For example, Volume 4 of the RCTS’s British Railways Standard Steam Locomotives series states that 9F No. 92127 was sold from Birkenhead shed to Buttigieg, Newport, in December 1967 and scrapped in the same month. However, we know that what really happened was that it was sold on November 7, 1967, was subsequently moved to Shrewsbury LDCP, and didn’t leave there for Buttigieg’s until March 5, 1968 (see BR despatch document see above). There are other examples. For the time being, the other members of the project have retained their memberships in the hope that the society’s management committee and/or the editor of the Standards books might change their position. I had hoped that each of the RCTS’s 30 branches would nominate a co-ordinator for the collection of data on the storage and disposal of steam during the 1957-68 period, yet only nine responded and one of those pointed out that it “was all a long time ago and no-one in their branch was interested”. Quite apart from the fact that ALL historians have no option but to research matters that occurred ‘a long time ago’, it seems to me that the RCTS’s desire to be a ‘modern’ society is the justiﬁcation for not wanting to get involved with the HSBT Project, despite us having received personal support from the then RCTS chairman John Redgate (who has since stood down from ofﬁce). The society does not seem to understand that a mixture of the historical and modern has proved a successful formula for The RM and other periodicals. Fortunately, its South Wales branch not only responded but provided a signiﬁcant amount of useful information. My thanks also to the Croydon & South London, North-East, Northampton, Scottish, Solent and West Riding branches. Your last article highlighted concerns about the quality of disposal information on websites. What is the latest situation? We asked each of the key websites whether they were aware of the HSBT Project and whether any of the disposal information on their sites had been derived from primary sources and, if so, which ones? The sources turned out to be secondary and two of the sites, Rail UK (www.railuk.co.uk) and BRDatabase ( www.brdatabase.info ), have subsequently included disclaimers with regard to steam disposals and referred visitors to the HSBT Project. When can we expect the HSBT Project to make the results of its researches available?I am hopeful that the ﬁrst volume will be published next year. We anticipate publishing regional disposal books, but will not do so until we are satisﬁed that all available sources of information have been examined. I still have to visit a number of retired BR ofﬁcials who have indicated that they have Special Trafﬁc Notices, which will clearly be of use to the project.The year 2011 was a difﬁcult one for me personally, but in my absence, the HSBT team has continued to beaver away. I must thank them all and, in particular, Keith Gunner for his support and incredible eye for detail, which have kept the project moving forward. I would also like to record my appreciation to everyone who has got in touch and to thank The Railway Magazine for its help in launching this project, as our initial credibility was established by having the support of the best-selling railway title. Even after four years, RM readers are still coming forward with new information. One, Rowland Pittard, has just located in his loft extensive personal notes of scrapyard visits in South Wales during the 1960s. Does YOUR loft or garage contain those elusive pieces of information we still need? If you are not on the internet, you can write to us at HSBT Project, 26 Priory Gardens, Langstone, Newport NP18 2JG. Are you in a position to publish a list of locos whose fate you have yet to establish? Not yet, but when we do, it will appear exlusively in The RM… so watch this space!